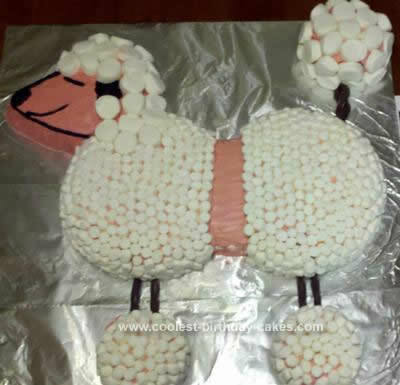 I didn’t have a pattern for the body of a Poodle Cake so I just used two 8″ cake pans for the body pushed close together. I cut out two triangles and put them where the body meets, to make it look like one piece. I traced around a measuring cup for the feet and tail and free handed the head. This is the fist cake I have ever made, I was pretty proud of it. Vy it.Well done on all your work.Iam sure everyone would have loved the cake.